Everything you need to start decorating your home for spring – all from TJ Maxx online! To get more information on any item that you’re interested in, simply click on the image. Use the arrows to scroll through all of the products. We had a whole week of warm temps above 70° last week and it has given me major spring fever. I can’t wait to begin the process of adding spring around my home! I always try to use a lot of what I already have, but it’s fun to add a new thing or two to keep things looking fresh and current. Don’t you agree? 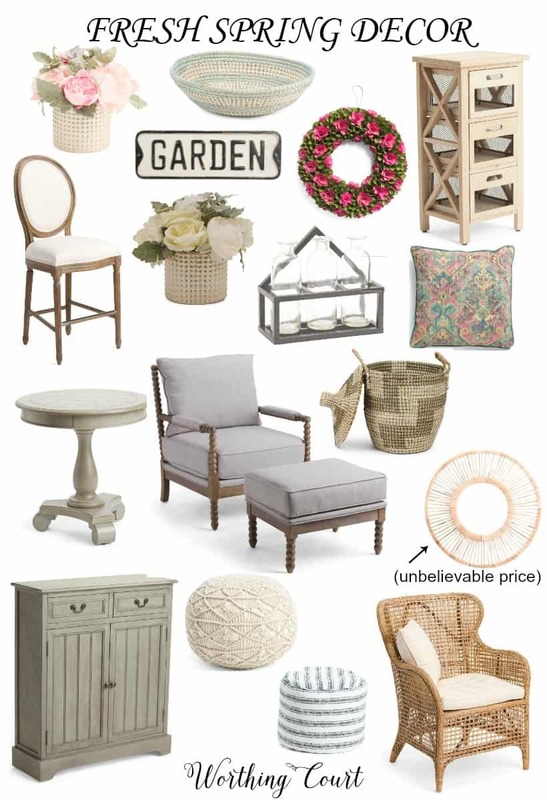 I’m hoping that talking and thinking about spring will help it to hurry up and get here, so I’ve put together a great roundup of accessories that will not only freshen up your home for spring, but that you can use all the way through the summer. One of the best parts is that it all comes from one of my favorite places to shop – TJ Maxx! I guess I had my head under a rock, because it wasn’t that long ago that I even realized that they have a online store. I hope this inspires you to start your spring planning early instead of waiting until the late minute. Maybe if enough of us talk about it, it will arrive early! « My Refreshed Coffee Bar And The Best Coffee Maker Ever! Thank you so much for the wonderful ideas. As always, you inspire me. Thank you for the tips, I’ve been looking for a tray for the coffee table and you may have given me an idea. Super cute stuff! Thanks for the inspiration! Thanks for the spring ideas and where to find them. A couple of things caught my eye. Spring, here I come!! Thanks for the inspiration. Thanks for providing the links!!! Thank you so much for sharing and providing where we can buy these great farmhouse items! I’ve been looking for some wooden candle holders and now I’ve found them! I like the variety. Good job on the research. I love all of your ideas!! Thank you for your inspiration! Thanks for all the pretty spring decor! I need to win the lottery because I would like to buy everything listed! Lol. Love all the items, but #1 is my favorite. I love that color! to see such beautiful rooms and ideas. Love the wire lanterns with bird finials! So cute! So many wonderful ideas! Thanks for sharing. Can’t wait for Spring in Oklahoma! Sometimes that’s tricky though! 40 degrees one day and 80 degrees the next! Thanks for the great Spring decorating tips! Thanks for the links and ideas! Thank you SO much for sharing these ideas and their sources! I have been eyeing some of these items in your decor – thank you!! Oooohhh, thesooden candle holders are catching my eye! Freshening up is so much FUN. I loved every item you showed! Now if money were no object….. My home definitely needs spring makeover! Thanks for the great ideas. I have a new house i’m decorating and your ideas are inspiring. All of those products are great. I especially like the candle holders and the TV stand. Love all your farmhouse style picks. Lots of inspiration. Thanks for these wonderful tips, Suzy. Love your mantle! All the ideas shown were gorgeous! Also, I really appreciated your shopping guide–ordered the blue and white dishtowels! Will give a nice farmhouse touch to my kitchen! Am also contemplating ordering the decorative panels. Just need to study them a little longer and decide if they are the right farmhouse style I am after. I really appreciate all your helpful posts! Thanks, Suzy, for your great tips! Enjoyed going through your shopping list. Ordered the blue/white kitchen towels. Love the decorative panels! Please continue to provide items available. All your help is appreciated! Wow- surprise Amazon for farmhouse goodies. Thanks for the tip! So much fun, thank you!!!! So many fun things. Thanks for sharing. Lovely ideas and yes, Spring is so close. I see our daffodils sprouting up already. Thanks for sharing your lovely Farmhouse picks at DI&DI. Thank you for your beautiful ideas! I have been feeling the urge to start spring decorating as it’s been warming up here in El Paso? I love those dish towels! Love ALL your decorating ideas! So lovely! Such cute ideas! Thanks for sharing at Over the Moon. We look forward to seeing you again next week. Love the variety of cute items! What a fabulous shopping guide for those searching for great Farmhouse Decor! Thanks for sharing your expertise with all of us! Another great giveaway – thank you so much! Great list! Lovin’ the farmhouse towels, and wooden candle sticks, the wooden trays and the white pitcher, want them all! You inspire me to make some changes to may mantle for Spring! I added a new urn and an antique finial last year and since I like the look I’ve been hesitant to change anything since then. I hung new floor to ceiling drapes last week and I love the look. Thank you for the inspiration! I just love your blog. So informative and I especially find your Shopping Guides incredibly helpful! Thanks Suzy!! I love the piece over you mantel and your use of layering. Classy and sometimes sassy, the Worthing Court blog provides something for everyone. I’m partial to the wooden trays. Versatility and good looking, these trays would work well in my home decor. Thank you for the great idea.